Sedum There are 9 products. 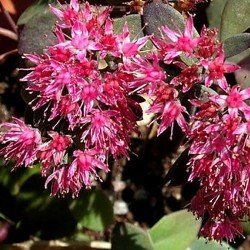 To creeping sedum beautiful, chocolate foliage. Flowers in umbels flat, dun turning dark chocolate rose. 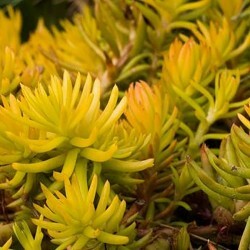 A rare shade for a sedum. Tolerates drought. To associate with green sedge frosted curls of water. 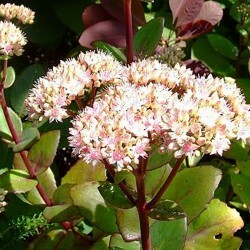 A mutation of sedum matrona he inherited his imposing stature. Its coloration related to black bronze reflections sopère throughout summer. Pink flower mustard. Drought resistant. Beautiful floral composition. 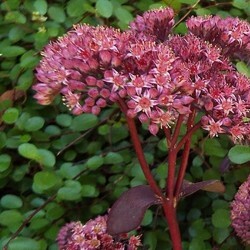 Grand sedum with purple stems and large green foliage murky purple reflection. The large flower heads (15cm) come in pale pink cameo. They remain decorative all winter. Recent cultivar. 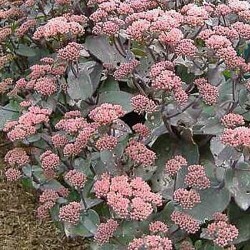 Creation of the vosges nursery bernard this new sedum aptly named "plum" with a violet purple foliage and abundant flowering raspberry flowers. Good cut flower. Solid cultivar sunny massif drained soil. Tuft drawn with thick stems and bluish green leaves irregularly macula cream. Large pink inflorescences. To install rock or 1st of a massive plan along with penstemons and gauras. 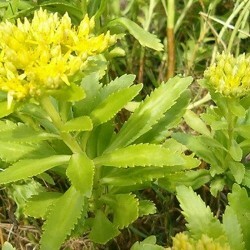 A golden vague to define what sedum. Maintenance and ungrateful for dry places. Indispensable to the garden and on your plate: its peppery salad sprouts are delicious! Yellow flowers in summer. 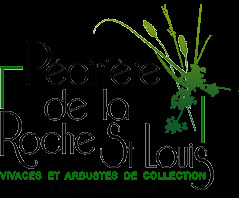 A sedum to laspect always impeccable. It forms a soft green ball and persistent blooms golden yellow honey fragrance. 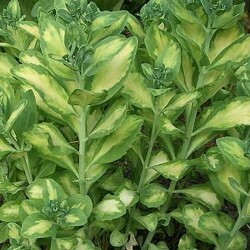 Easy to grow in any soil drained, supports drought. Rockery, massive and hotpot. 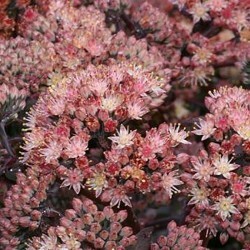 A sedum award from the royal horticultural society english. Compact habit, large deciduous pourprant emeralds is in the fall. Rich pink flowers. Good cut flower. Solid cultivar for solid sunny, drained land. A new sedum, port compact cushion. 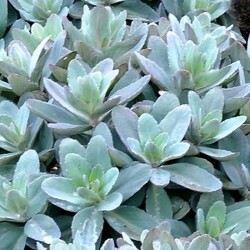 Remarkable and regular foliage (void) silver pourprant summer. Abundant flowering raspberry purple heads on strong stems. Good flower bouquets. Drained soil, drought resistant.